According to new international research conducted by the Stanford Woods Institute, human activity has prompted the beginning of the Sixth Mass Extinction event recorded on earth, threatening to wipe out hundreds of thousands of species, including humans. Professor Paul Ehrlich offers what he claims to be a “conservative estimate” of species loss due to human behaviour, which he puts at 100 times faster than the background rate of extinction (a base rate of extinction if humans were absent.) The team deliberately underestimated their estimates because recording species loss is notoriously difficult, yet their statistics are all the more shocking for it. A devastating mixture of habitat loss, climate change, pollution and overpopulation has led to an environmental disaster that scientists refer to as the Holocene extinction. It is expected that this extinction event will be as severe as the End-Crustaceous Mass Extinction, which wiped out the dinosaurs 65 million years ago. That was, of course, due to an asteroid collision; this mass extinction is entirely due to human behaviour. 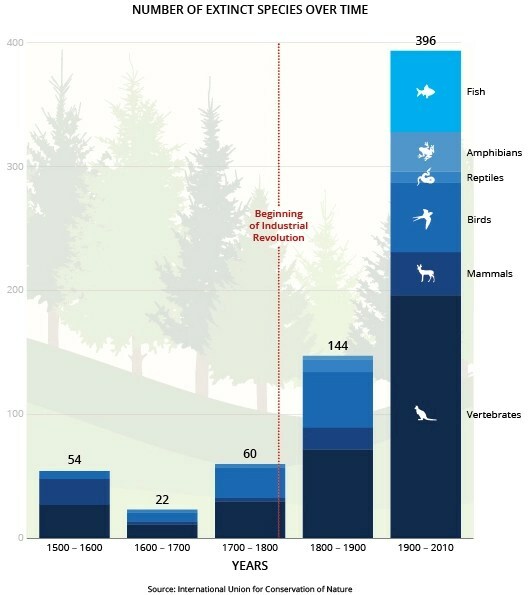 International Union for Conservation of Nature chart showing species loss over the last century. And why should we care that species are dying out while humans industrialize the planet? We need biodiversity: it pollinates and irrigates our crops, purifies our water, and produces our food. We are entirely dependent on biodiversity. Biodiversity is extremely important. It’s unfortunate everyone can’t seem to realize this yet. This post was a great share of information from the study.